Founded by two Brits Ian Hibbs and Julian Dunkerton back in 1985, Superdry is renowned for combining the Japanese’s notable take on high quality with their British modern designs. The fusion of the two has created a brand, particularly with staples such as winter jackets, that means you won’t need to compromise on warmth or style. An added bonus - Superdry caters to both men and women, with many pieces suitable for either. This fall, Superdry has introduced new design elements into their jackets - bright pops of colours, bold branding, power fading (an ombre effect) and luxury trims. For the fashion direction? They’ve incorporated the urban street-style of London with a nod to the 90’s nostalgia fashion that dominates A/W apparel. The pieces are proof you don’t need to be boring or plain to fulfill a heavy-duty function, such as staving off dry snow or cold chills. 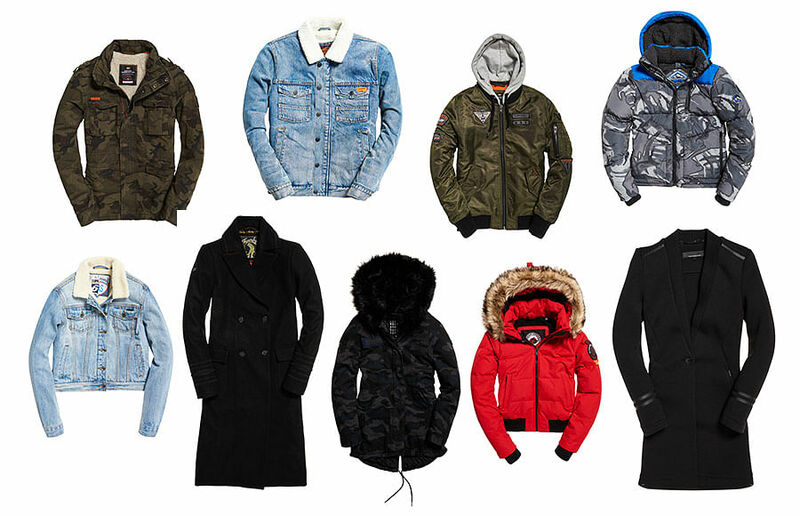 The jackets are split into three distinct groups: Casual, Wind-family and Snow collection. Casual is exactly what it says, and includes leather, padded, wool and denim jackets, but the other two gets a little more complex. Which is why we’ve delivered this very feature - to help you distinguish what you need to buy (particularly for your vacations) and why it works for you. Superdry’s solution to volatile weather changes that you may experience on your travels is their wind-family collection. Consisting of eight jackets with 15 variations, the series has three sub-categories for differing conditions: Windtrekkers, Windattackers and Windcheaters. Windcheaters provide most protection with a triple-zip fastening, followed by Windattackers with double-zip then finally Windtrekkers with single-zip fastening which is the easiest option to layer with other pieces. Windcheaters and Windattackers also both come with ribbed cuffs with thumb holes and double layer collars that add extra insulation. Aside from this, you can count on any of the Wind-family jackets to deliver on warmth and internal insulation. The Wind-family jackets are made with either a mesh or a fleece lining, both composed of polyester. Mesh would be lighter in weight but fleece lining would provide more insulation because it mimics sheep’s wool and traps more air. But if you are heading to a location that has snowfall or plan to engage in snow sports, the Wind-family series is not sufficient. Enter, the Snow family. The Snow family has over 14 jackets with 19 style variations and can be subdivided into three sections of increasing protective qualities - light tech, full tech and premium apres. Superdry uses two different quilting methods for such snow jackets - sewn through and baffled box. The former fills the jacket with down and stitches them directly, and this traps the feathers and reduces fluffiness and unnecessary bulk. The latter does the contrary by creating small walls between quilted sections to prevent any compression of down and lowers the chances of cold spots within the jacket. Both, of course, keep you snug. In addition, some of the snow jackets use down feathers to add insulation - now approved by the Responsible Down Standards (RDS) for humane feather procurement processes. Before we delve into which snow jacket are suited for which weather condition, you need to know how Superdry classifies their technical capabilities. The first term to know is breathability, measured by k/g. Numbered in the thousands, a high number denotes high levels of breathability, which means that more moisture and sweat will be wicked out through the jacket. If you’re just lounging by the snow lodge or doing light physical activities (e.g. walking), a rating of 5k/g to 8k/g is sufficient. But if you are going to be participating in lots of snow sports, a higher rating is better. The second term to know is the level of water resistance, measured by k/mm. Also numbered in the thousands, a higher number would mean greater waterproofing ability. If the chances of rain and wet snow are low, a lower rating of 5k/g to 10k/g should suffice. The light tech range has between 3-5k/g and 3-5k/mm, which makes them suitable for days of light activities and aren’t particularly wet or cold day, such as skiing or boarding on sunny, clear days. The full tech range has ratings between 8-15k/g and k/mm and would provide you protection from the rain and snow, while being breathable and comfortable. The premium apres collection has an average of 3k/mm rating and is especially suited for people who want the best of both fashion and function. This range offers light tech features but with added stylistic details through the use of fabrics, colours, faux fur and down feathers. Down feathers ensure that the jackets provide utmost warmth while being lightweight and compact. With proper care, a down jacket can be worn for a long time and is a good investment for your winter wardrobe. Snow aside, Superdry also update their casual jackets yearly - for those wanting something that doesn’t need to fend off wind or snow. The light denim options are particularly perfect for Singapore’s changeable weather, meaning you don’t need to be going away to have reason to purchase a new jacket. Tempted to get a jacket from Superdry? Here’s an added incentive for you from now to Nov 30, the brand will be extending a 20% discount off their jackets. All you have to do is to flash this article at these three stores - Mandarin Gallery, Suntec City and VivoCity - to enjoy the offer. Have a toasty winter holiday! The offer cannot be combined with other promotions or bundle deals, and other terms and conditions apply.